In our previous article on the new Russian national idea, we noted that such an idea-ideology has been identified. Of course, it's impossible to describe any ideology, even the most primitive one, in a three-page article, but it's feasible to present its major elements in a series of publications, which is exactly what we are planning to do. This article provides further evidence that CIVILIZATIONAL development is gradually becoming a mainstream idea in modern Russia. Interestingly, this evidence was presented by none other than Zbigniew Brzezinski, the oldest member of the globalization party's central committee. In his recent speech at the Wilson Center, in which he urged Western elite to impose a new arms race on Russia, the inveterate propagandist of US exceptionalism said: "What we are seeing in Ukraine…is not a pique but a symptom of… the gradual but steady emergence in Russia… of a quasi-mystical chauvinism." How are these nonsensical claims by an old Cold War dinosaur related with the civilizational idea? In fact, there is a direct relationship, as, according to Brzezinski, the Russian "chauvinism" is based on the "conviction (of the Russian elites) that Russia is not part of the Western civilization. It is also not part of China. It is not part of the Muslim World. Russia itself, it is asserted, is a great civilization." The keyword here is "civilization." It is precisely the idea of Russia as a distinct civilization, which the prominent Russia hater disputes, and this is not surprisingly. Essentially, Brzezinski says that Kiev is allowed to build a Great Ukrainian Empire, since the Ukrainian junta is not encroaching on the sacred cow of US global dominance. Russia, on other hand, can't even think of its identity, as any genuine Russian idea is first and foremost based on sovereignty, which for Washington is more than a crime, it's a challenge. The master of defamation consciously ignores the fact that for the Russians, internationalism is a key element of their national identity. This has clearly manifested itself in Ukraine's southeast, where people of different ethnic groups are resisting the Nazi-Galician gang. This internationalism, which is inherent in Russia's self-identification, scares Brzezinski, and is the reason why he is in a rush to pin the label of chauvinism to the idea of Russian civilization. As a master propagandist, Brzezinski knows quite well that the West should fear not the revival of the Soviet Union or a Russian empire and not even the rise of "asianism," Russian fascism (the favorite bogeyman of people like Boris Berozovsky and Valeria Novodvorskaya), or any other radical ideologies, but the emergence of an independent Russian civilization, as only a supranational and independent world outlook will allow our country to withstand and develop. The fact that this devil's advocate is getting nervous and spouting venom indicates that Russia has finally identified a national idea (based on Russia as a distinct civilization) appropriate for today's world. In his Fulton style speech at the Wilson Center, Brzezinski used all conceivable and inconceivable arguments to support his compulsive idea to prevent Russia by all means possible from realizing any effective development project. In doing so, he used time tested tactics of false claims. The first such method in this arsenal is blame-shifting. He is trying to blame Russia for something that the US could and should have been blamed in the first place. 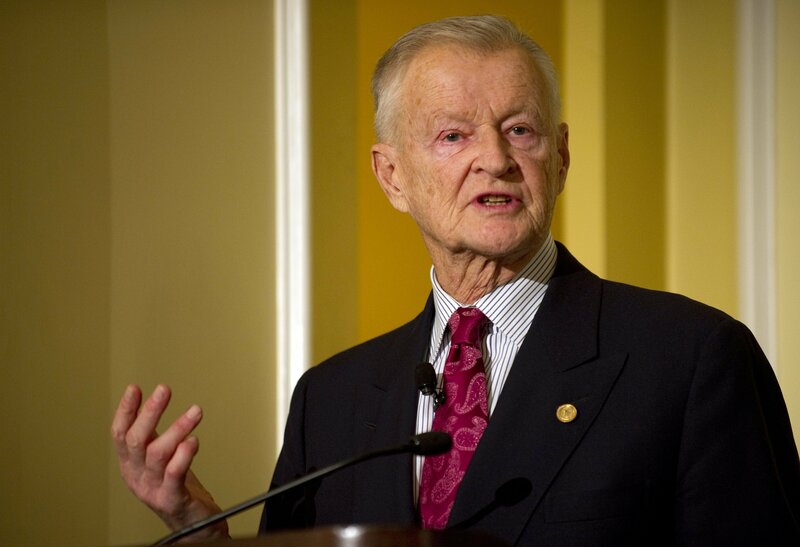 Brzezinski called "ambitious" the forming civilizational outlook in Russia, without even bothering to provide any evidence as to what exactly is ambitious about it. Perhaps he is referring to Russia's opposition to the US-backed Banderovite sentiments in Ukraine. In fact, the whole world knows that the United States has long been the world's most ambitious power. The world is too small for US ambitions. In general, turning facts on their head is the favorite tactics of US experts and politicians. Just a week ago, President Barack Obama called Russia a two-faced Janus at a time when the duplicity of US policy has been particularly evident. In the early 2000s, Alexander Zinoviev wrote in his book The Russian Tragedy: "The main result of the change that occurred in the world is the fact that the United States has followed in the footsteps of Nazi Germany. There also developed an ideology of global aggressors, comparable with the racial ideology of fascism and Nazism, which asserts the supremacy of Western nations over the rest. The latter are considered subhuman." Speaking of ambitions, this is a much more credible case in point. So, Russia can't be blamed for being excessively ambitious, unlike Washington, which is poised at achieving its great dream of global dominance. Alas, the old liar Brzezinski is not interested in the results of public opinion polls and other reliable facts. Like Barack Obama and Hillary Clinton, he "knows" in advance that all "evil" on Earth is the fault of Serbs, Iranians, Syrians, and now Russians. Putting on a peacemaker's mantle, the well-known warmonger claims that Russia is posing a threat to the Baltic States, Georgia, Moldova, and Belarus. Obviously, the truth is exactly the opposite. It is Washington, not Moscow, which is posing a threat to Belarus, Moldova, Armenia, and Azerbaijan, having targeted these countries and using the same scheme as in Ukraine to unleash a civil war there. "We have to obtain the termination of Russia's deliberate efforts at the destabilization of Eastern Ukraine," Brzezinski urges, knowing quite well who is giving orders to the junta in Kiev to kill peaceful residents in those parts of Ukraine, and who downed the Malaysian airliner over Ukraine's southeast to provoke even more chaos in the region. While not focusing too much on the many examples of Brzezinski's ingenious mythmaking, we should note, however, that this character still has significant influence on the formulation of US foreign policy. Unfortunately, his speech at the Wilson Center in June is not just senile dementia, but a quintessence of views held by certain politicians in the United States, who believe that there should be no place in the world for nations, not to mention civilizations, independent of the United States. Another method of traditional demagogy used by US officials is the deep contempt towards all nations (including their own), and as a result, the practice of laying the blame for all anti-American "insinuations" on the leaders of the countries, subjected to US foreign policy racket. We know that Washington doesn't trouble itself with a detailed analysis of world events, preferring instead to convey the "truth" through the likes of Jen Psaki. The tragedy in Ukraine is also, according to Brzezinski, not the fault of the local Nazis and their American patrons, but… the Russian President. Here is another Jesuit thesis of this poker player, pretending to be a great chess master. Putin, according to Brzezinski, played the main role in the rise of Russian Chauvinism. (We must have been naive to think that Putin embraced patriotic values as a result of objective processes reflecting the growth of self-awareness in Russia.) This is yet another case of duplicity. It turns out that a civilizational idea is not a result of objective development, but, he says, was invented by Putin (naturally, out of low motives) and is now being forced down the public's throat while the public is largely prone to Americanophilia. Indeed, in recent decades, Russia was bending down to this heel all too often, but today, more and more people in our country are realizing the original meaning of the words Dignity, Truth, and Justice, which form the basis of the Russian civilization's value system. This is precisely what werewolves like Brzezinski and company blame President Putin for.